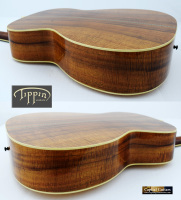 Offered here is this superb, traditional style, Koa OM built by master luthier Bill Tippin of Massachusetts. Originally built in 2001, this guitar went back to Bill in 2017 for what he calls a "total revoice." 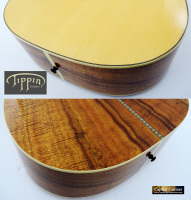 This is a very labor-intensive and expensive process whereby the guitar's internal bracing is meticulously re-sculpted via the sound hole to improve it's tone. Bill also gave the guitar a new compensated bone saddle and bone bridge pins at that time. An already great instrument was updated and made even better. 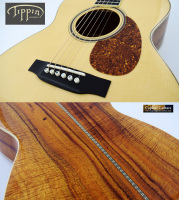 The specs of this beautiful instrument include a premium grade Engelmann Spruce top combined with highly figured Koa for the back and sides. The 14-fret neck is made of Mahogany with a relatively sleek, very soft V-shaped neck with a depth measurement of .83" at the first fret. It has a 25.4" string scale, a 1-3/4" bone nut and 2-5/16" string spacing. 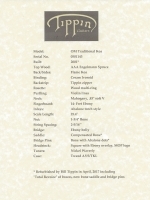 It has cream ivoroid binding on the body, neck and headstock. 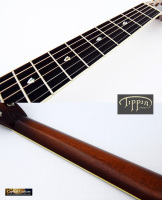 The Ebony fretboard has Abalone torch style fret markers. 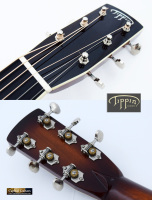 The tuners are nickel open backs by Waverly. The sleek neck and a superb setup make this guitar as easy to play as an electric. It is setup with light gauge Elixir phosphor bronze strings with 12th fret string heights of 6/64" on the low E side and 4/64" on the high E side. It has a tone that can be intimate and sweet sounding or loud and powerful depending on your level of attack. Please listen to the brief sound sample included. It has a voice that is clear, crisp and well balanced. Despite it's age, this guitar remains in fabulous condition. 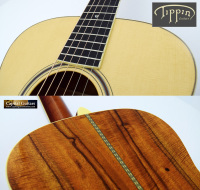 The top shows a few impressions which are pictured herein, but otherwise this guitar remains in superb condition and the frets show little wear. It comes in a newer TKL/AVR tweed case, also in excellent condition. 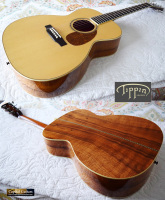 Bill Tippin is well known for making some of the best OM-sized guitars available and pre-owned examples like this beauty are highly sought after. 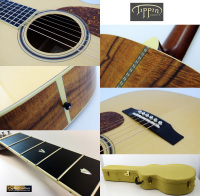 Make this gorgeous Tippin OMT-K yours today.